The new President of the Democratic Republic of Congo, Felix Tshisekedi, was sworn in Thursday during a dramatic inauguration during which he briefly took ill.
As Tshisekedi gave his inaugural speech, he stopped briefly, saying during a live TV broadcast, “I don’t feel well,” according to a Reuters video feed. 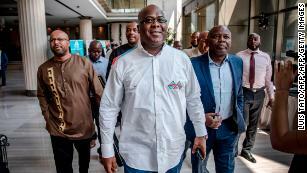 Felix Tshisekedi, center, was named the winner of the Congo’s presidential election. Tshisekedi takes over from outgoing President Joseph Kabila in the first peaceful handover of power in the country’s history. Tshiskedi is only the fifth president of Congo since it gained independence from Belgium in 1960. The inauguration was held at the Palace of the Nation, the seat of the presidency, and was attended by Kenyan President Uhuru Kenyatta, Kenyan opposition leader Raila Odinga and other dignitaries from neighboring countries. Tshisekedi’s election was mired in controversy, and there was widespread surprise after the country’s electoral commission announced he’d won. 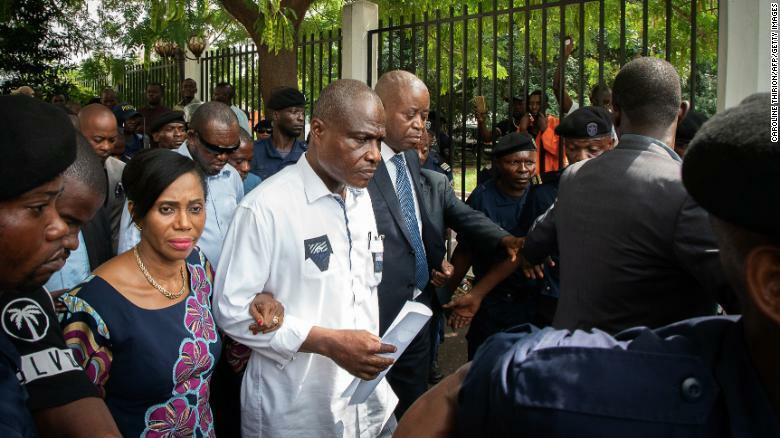 Martin Fayulu, center, leaves court Saturday in Kinshasa with his wife, Esther, after filing an appeal. The Catholic Church in Congo also rejected the outcome of the Central African nation’s presidential election, saying it didn’t match the data collected by its observers. Fayulu launched a court bid to order a recount, but the Constitutional Court rejected his appeal and declared Tshisekedi the winner. Kabila, while ruling a nation rich in deposits of diamonds, gold and tantalum, accumulated vast wealth. From 1999 to 2002, his regime transferred ownership of at least $5 billion in assets from the state mining sector to private companies under its control, according to the United Nations. The country’s first Prime Minister, Patrice Lumumba, was executed by firing squad in 1961, and military dictator Mobutu Sese Seko came to power in a coup. After three decades of iron-fist rule, Mobutu was overthrown in 1997 by rebel leader Laurent-Désiré Kabila, who was assassinated nearly four years later. Joseph Kabila inherited the presidency from his father. Tshisekedi also comes from a storied political background. His father, Étienne Tshisekedi, founded the Union for Democracy and Social Progress, the oldest and largest opposition party of the Congo. Felix Tshisekedi took over the party following his father’s death in 2017.